CKD Galbraith is Scotland's leading property and rural consultancy but they are also leading in the field of outdoor challenges with staff members conquering yet another test of physical and mental stamina in the RSABI Great Glen Challenge last Friday (26th August). The Great Glen Challenge is just one of many such events the firm has taken part in over recent months, with several teams having competed in the Lanrick Challenge, which saw them take home the winner's trophy, and six colleagues having also conquered one of Scotland's most gruelling endurance events, The Caledonian Challenge back in June. So far this year the firm's efforts have raised well over 4,000 for a number of important charities such as the RSABI, Foundation Scotland, Scotland's Charity Air Ambulance (SCAA) and The Sandpiper Trust. Good team work is second nature to the firm and it played a vital part in Friday's success at the Great Glen Challenge which involved a 46km mountain bike trail, 6km kayaking, 18km walking and a 17km run. 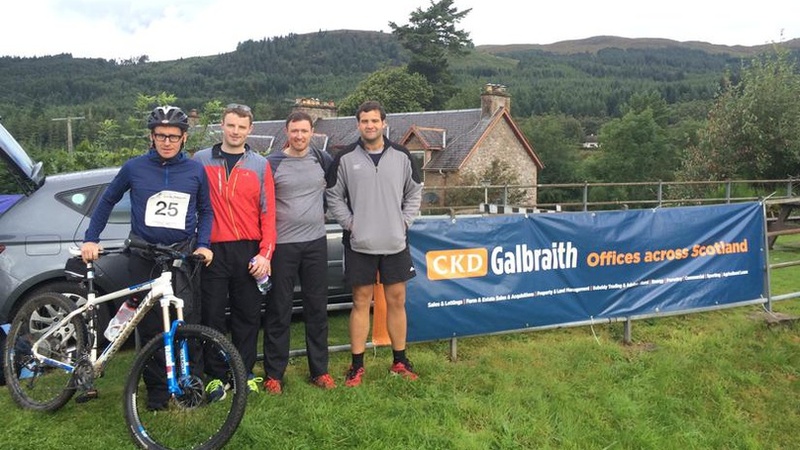 CKD Galbraith, a Partner and the Route Sponsor of the Great Glen Challenge, entered three teams of four, plus a support driver, made up of staff from across the firm's residential, rural and building surveying departments. For the second year in a row the firm secured two places on the podium taking home both the Bronze and Silver medals with strong individual results members of each of the three teams. The winners were Watson Seeds. The Great Glen Challenge was set up five years ago to raise much need funds for the Scottish rural charity RSABI. The charity provides financial assistance, support and advice to those people who have worked in Scotland in land-based occupations and who are suffering hardship. Every year RSABI helps hundreds of people with backgrounds in farming, crofting, forestry, horticulture, fish-farming, gamekeeping and rural estate work who, due to illness, disability, poverty or crisis, find that they are unable to cope. We were extremely proud to take part in the Great Glen Challenge and trained hard to be in tip-top shape! So far we have raised an impressive 1,780 in total for RSABI and had a great deal of fun doing so. We will be working hard to make sure that we meet our final target with further fund-raising taking place in the coming weeks. Out of a total of 24 competing organisations we took both bronze and silver places which is fantastic! As a firm we have an excellent reputation as sporting competitors and we really enjoying training and working together at such outdoor events to uphold this. Unsurprisingly as a rural consultancy, the majority of CKD Galbraith's staff enjoy being active and on the move outdoors so it's brilliant to be able to take on such a difficult day together and let our competitive natures take over! CKD Galbraith will continue to hold various fundraising events in the coming weeks and you can still donate to RSABI by sponsoring #TeamCKDG until the end of September, to donate please click here. For further information on the RSABI Great Glen Challenge please click here.